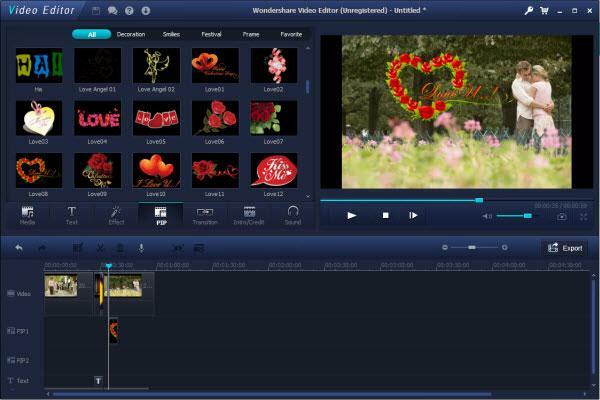 Wondershare Video Editor is the fun, easy-to-use video editing software designed to let beginners make home movie magic in minutes. It works great with video shot by any type of digital camera, camcorder, mobile device, etc. And with all major standard and HD video formats. Or, if you want, record and edit video directly from your computer’s webcam. 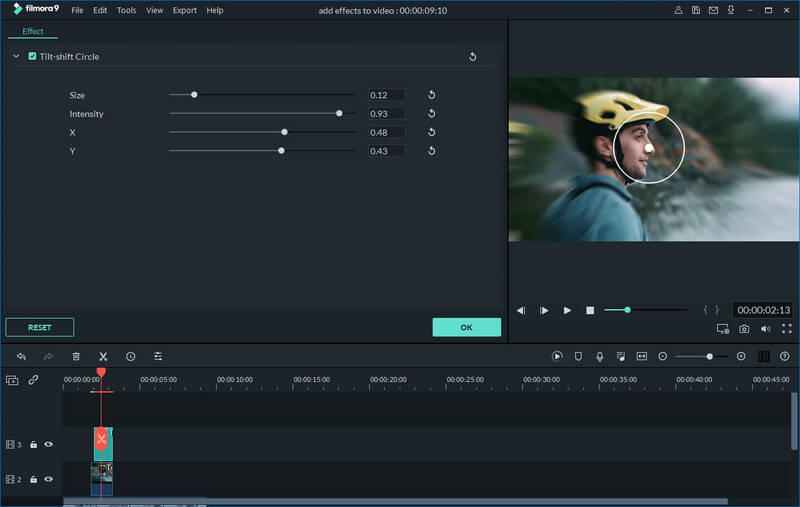 On board are many special editing features like Jump cut and mosaic blur as well as standard editing tools, including Crop, Split and Rotate. This, combined with 300+ dynamic visual, audio and text effects available for free download, makes taking your home video to a new level of enjoyment easier than ever! 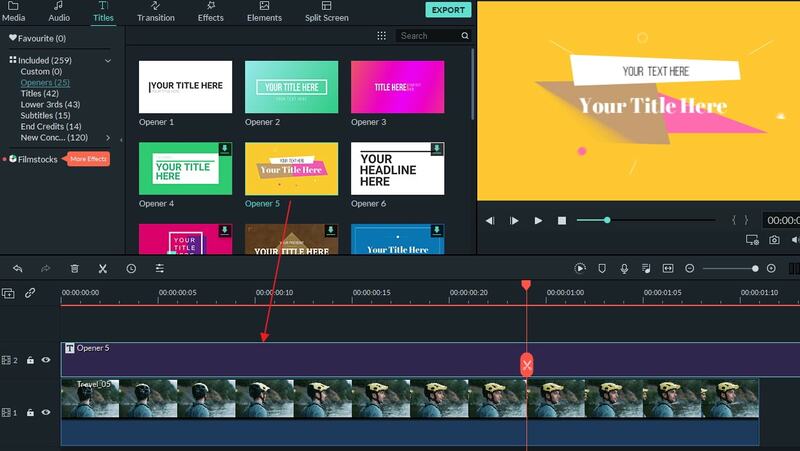 How to Use Wondershare Video Editor ? Wondershare Video Editor organizes all your media files in your User's Album manager. First you need to import all videos, photos and audio to the album for later use. 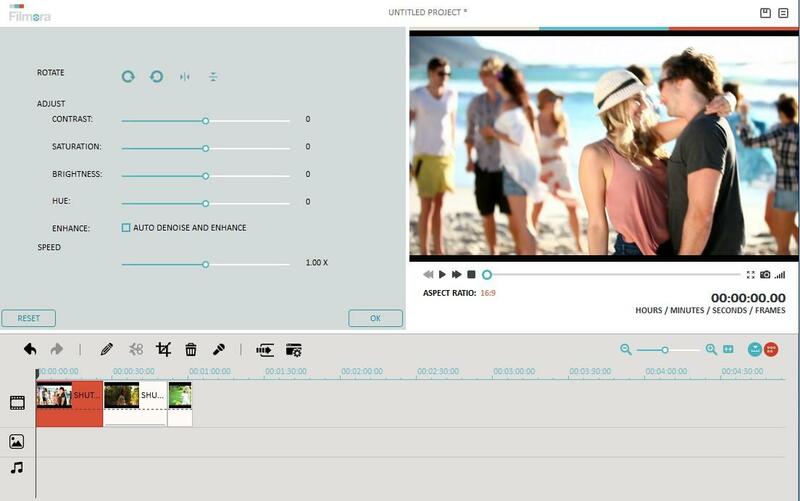 Now run Wondershare Video Editor, choose 16:9 or 4:3 ratio, and you will get the main interface like below. Click Import to select videos, audio and photos from your computer, or click Record to capture videos with a connected capturing device (e.g. webcam). You can also batch drag and drop files to your album. To help you quickly find what you want in the album, this program sorts the files by name, duration or type. You could also preview the files simply by double clicking. When previewing, click Full screen to play in full screen, and click Camera icon to take snapshots to the specified folder. To edit media files or make a new video, drag media files from your Album to the Timeline at bottom. (When a yellow box appears, release the button.) It's a good idea to save your project for backup purpose. Also you can click the product icon and select Settings to specify options for the program, such as default snapshots folder, update frequency and messages. Important: Don't drag and drop a file to the existing media on Timeline unless you want to split it. To help you better add many files at once, drag the slide bar to adjust the view size of the Timeline. In the Timeline, you can cut, copy, paste and delete any clip any time you want, and click Undo (or Ctrl + Z) to cancel. As you can see, all the changes can be previewed in real-time so you can make sure everything you do highlights your videos. Select media on the Timeline and double click it to open the editing panel. Once you enter the editing mode, you can instantly change to another media file to continue editing without reopening the panel- this will save you a lot of time. When you double click any video on the Timeline, you get the panel that contains Video and Audio bar, allowing you to edit the video track and audio track in a video. Note that for audio files, it only shows the Audio bar. 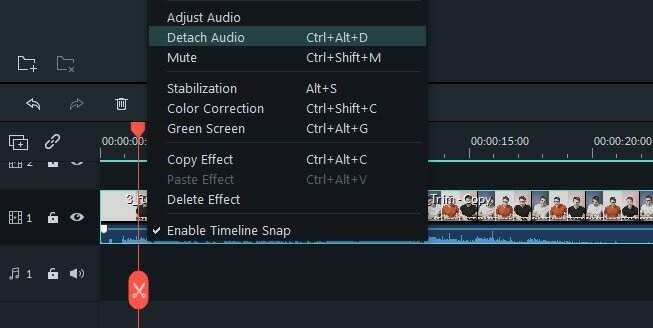 Note: If you want to change the audio of video to your own voiceover or other audio clip, when you have added the audio clip to the audio timeline, you'll need to highlight the video and right click to choose "Mute" option. 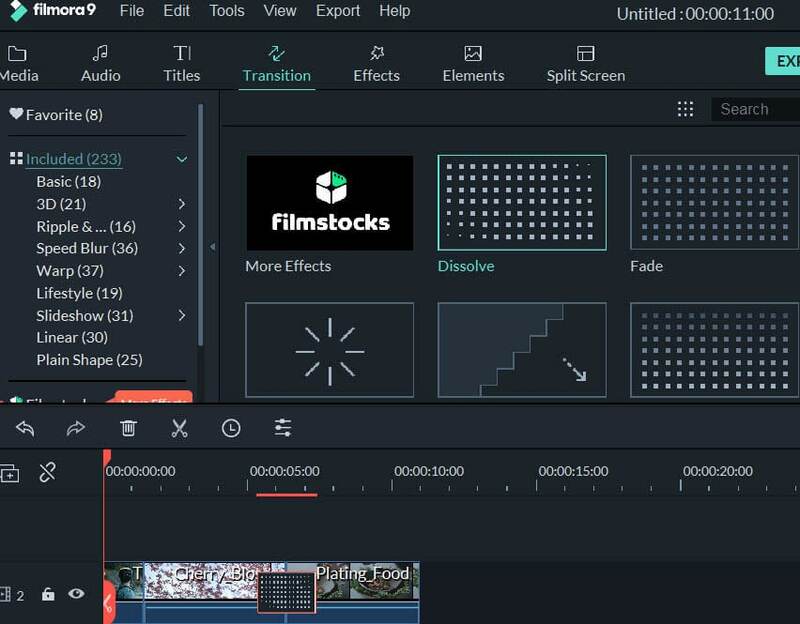 Common tools: Common Video tools include Crop, Rotate (Flip), Adjust and Speed (Fast and Slow Motion), while Audio tools include Volume, Fade in/out, and Effect (Voice change). Simply use the slider to tune your video/audio up. You can immediately view the result on the preview windows. If you are not satisfied, click Reset to start from scratch. Trim video/audio: Mouse over the left or right edge of a video or audio on the Timeline, and when the "double arrow" indicator appears, drag to trim to any length you want. 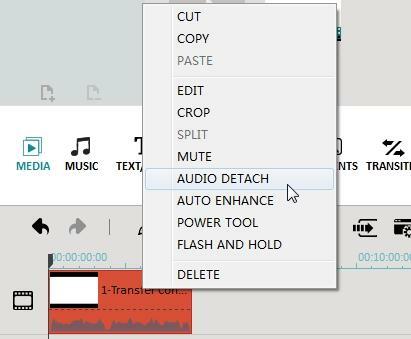 How to Detach Audio from Video : To detach audio from video, simply right-click the video and choose “Audio Detach” from the pop-up menu—the detached audio track will automatically appear on the timeline in the audio slot. There are two categories of tools to edit a photo: Photo and Motion. The Photo category provides common photo editing tools like crop, rotate (flip), and several adjustment tools. In the Motion category, you can turn any still photo to animate one with up to 36 Motion (Ken-Burn) effects. Double click on any motion to apply. To remove the added motion, right click the thumbnail on the Timeline and select "Delete Motion" from the menu. It's convenient to add voiceovers to your movie. 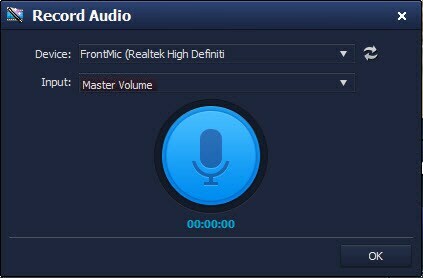 On the toolbar above Timeline, click Record to bring up the Record Audio dialog. Hit Start and you will have 3 seconds of countdown to start speaking. When finished, click Stop. To start a new record on the Timeline, no need to close the dialog, just move the Time Indicator to another position and hit Start again. To apply a close-up to your video, simply click the video file on the timeline, then on the toolbar directly above, click the second icon from the right. This will automatically add a flash and hold segment to the beginning of the clip. Click and drag the new section to place elsewhere. All of these functions can be accessed by clicking the video file in the timeline, then on the toolbar directly above the timeline, click the furthest right icon. A window will appear allowing you to click to apply any of these four effects. It's pretty easy to add titles, effect and intro/credits to your movie. Just switch to Text, Effect or Intro/Credit tab, and then drag and drop an item to the Timeline. You can preview the new video right away. If necessary, double click the added item to customize it, e.g. time of duration. After choosing your desired title style, you can double-click it and design the content, set font, color, animation, etc. When finished, click Return to go back to the main interface. More than 50 visual effects instantly bring your videos to the next level. The added effect will be applied to videos and photos. For some effects, you can double click on them to change the parameters. The Intro/Credit can be added in any position on Timeline to create chapters, intro, credit and casts for your video. Actually, Intro/Credit is a combination of a photo and a title, you can double click on them to edit just like editing photos and titles. 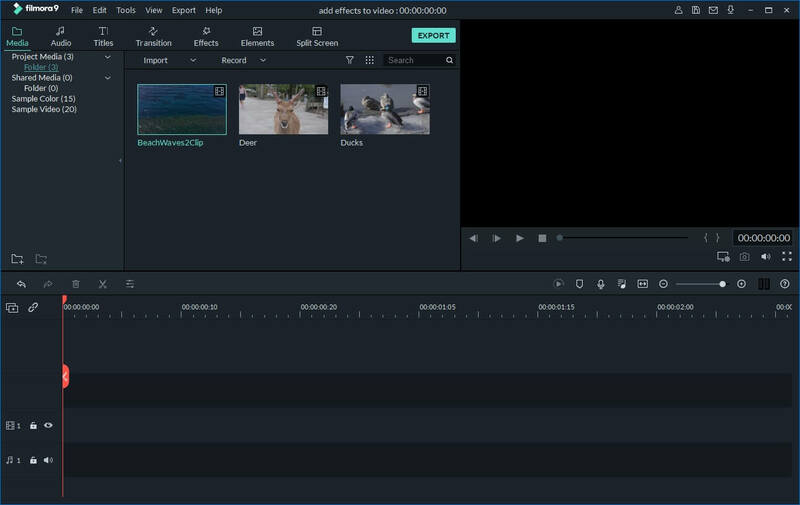 If you want to add some transitions between your video or photo clips, you can hit Transition tab above the Timeline, and then drag your favorite transition effect between two clips. When you place your mouse cursor on a certain transition, you can have a preview of it or double click it to preview in larger size on the right window. When adding transition effects, you can right click on any transition to apply to all or just apply the transition to all with random transitions. Tips: You can add selected transition to Favorite so that you can find it quickly later. By double click the transition on the Timeline, you can manually set its duration and apply new duration to all. Picture-in-Picture is an additional video clip or a picture on the main scene. 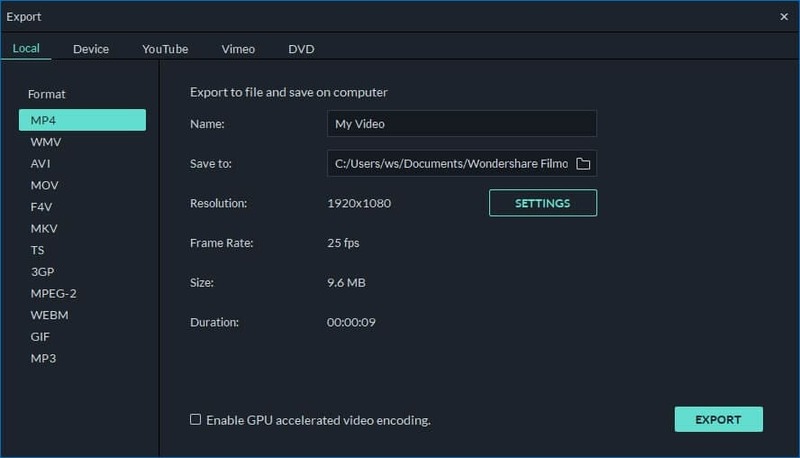 Wondershare Video Editor now makes it possible to create an appealing Picture-in-Picture video in clicks. Simply drag imported video/photo or items in PIP tab to PIP Timeline, and bingo! You get a Picture-in-Picture video. Next, you could double click on PIP items on the Timeline to personalize your picture-in-picture video/photo with Motions, and even additional effects like shadow, border, alpha, and mask by clicking Advanced. After finished editing, hit Create and you get four ways to output your videos: Device, Format, YouTube and DVD. 1. Device: You can choose from iPhone 4, iPad, iPod touch, PSP, Wii, Creative, etc. to get the optimized videos for your devices. Name your video and set a destination folder. And then hit Create to save your videos to a specified folder. Advanced settings like video and audio encoder, frame rate, bit rate, etc. are enabled (Click the little triangle button). 2. Format: You can output video to all popular video formats such as AVI, WMV, MOV, FLV, MP4, MKV, MPEG, etc. Afterwards, design the name of your videos and choose the output path, and then hit Create to start saving videos. 3. YouTube: This option allows you to share your work on YouTube directly. Fill in your YouTube account information and the video information like category, title, description, etc. to share your video creation with more people on YouTube. Additionally, you can check out Facebook and Twitter options for sharing. 4. DVD: On the DVD tab, set the DVD parameters: DVD label, type, video quality, TV standard and aspect ratio. You can burn movies to DVD or save movies to an ISO image file.